A racial partition of the United States for the purpose of racial preservation and independence would involve the creation of separate, independent and sovereign racial nations in accordance with the principles of racial rights, racial security and the Racial Compact. 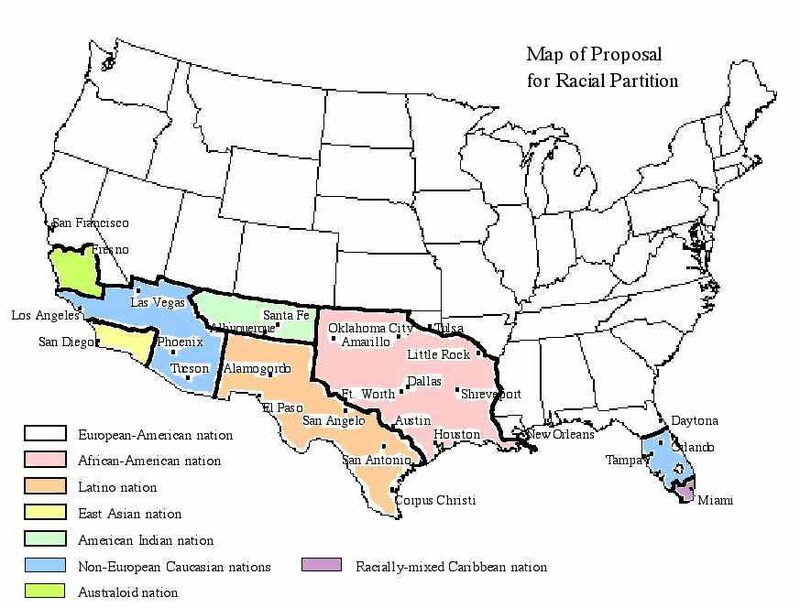 A just partition would take into consideration the relative historical role of each racial group as well as their current position, and a practical partition would seek to create compact racial nations with geographical integrity and the shortest possible borders for their area. Persons of mixed racial ancestry would be classified according to their visible racial traits, characteristics and identity (or phenotype) and assigned to the most appropriate racial nation. Racially-mixed families would be classified and assigned according to the racial identity or phenotype of the children. Many different plans for partition are possible. The author offers the following proposal as one possibility for consideration. 1. A European racial grouping consisting of the European-American population (i.e., those Americans of European racial type and ancestry) and centered around the Northern European or Nordish-American population as its founding, racially defining and predominant core element. It would also include those persons of mixed European and non-European ancestry whose European ancestry is predominant, whose non-European ancestry is not physically obvious, whose physical phenotype or appearance is within the normal European range (i.e., who are of European racial type), who are socially recognized and identified as European, and who are assimilated into, and personally identify themselves with, the European-American population. This grouping comprised about 86% of the U.S. population in 1880, 79.7% in 1970, and 72% in 1994. 2. A Congoid (Sub-Saharan African) grouping consisting of all members of the Congoid race (including all persons of obvious partial Congoid ancestry except the mixed Afro-Hispanic Caribbean peoples of grouping #8 below) in North America, and all those in Europe who cannot be practically or humanely repatriated to their own ancestral homelands. This group comprised 11.1% of the U.S. population in 1970 and 12.1% in 1994. 3. A "Latino" Mestizo and Amerindian racial grouping consisting of the Mexican, Central American and South American Mestizo (mixed Amerindian and Caucasian) and Indian population. This group, the great majority of the U.S. "Hispanic" population, comprised 2.5% of the U.S. population in 1970 and about 8.8% in 1994. 4. A North American Amerindian grouping consisting of the native North American Indian population. This group comprised .4% of the U.S. population in 1970 and .8% in 1994. This would not include persons of mixed European and North American Indian ancestry who are predominantly European and are assimilated into the European-American population. 5. An East Asian racial grouping consisting of those members of the Mongoloid Northeast Asian and Southeast Asian races in North America, and all those in Europe who cannot be practically or humanely repatriated to their own ancestral homelands. This group comprised less than 1% of the U.S. population in 1970 and about 2.5% in 1994. 6.1) A North African and West Asian racial grouping consisting of all the non-European Caucasian population elements (i.e., Caucasian elements of non-European racial type or ancestry) primarily of North African, Middle-Eastern, Arabic, Anatolian, Central Asian, Iranian, Afgan, Pakistani, Bangla Deshi and north Indian racial type and origin, as well as the non-Australoid elements of central and southern India. This would include the Saharid (South Mediterranean), Orientalid, Armenid, Turanid (Turkic), Irano-Afgan, Pakistani and Asian Indian (Indic and Dravidic) populations in North America, as well as those in Europe who cannot be practically or humanely repatriated to their own ancestral homelands. This grouping comprised about 4% of the U.S. population in 1970 and 4.8% in 1994. 6.2) Europeans with non-European or mixed-race children, whether natural or adopted, and their non-European mates, who choose not to be grouped with the non-European race of their children, but to be grouped with a primarily Caucasian population, as well as their European close relatives (e.g., the European grandparents of the mixed-race or non-European child) who choose to be with them. The inclusion of this large and growing racially-mixed population element makes this grouping effectively multiracial. The author estimates that in 2008 about 10% of the children born to European-American women had non-European fathers. This is a percentage that has approximately doubled about every twenty years since 1948 -- from circa 1.2% in 1948, to about 2.5% in 1968, 5% in 1988 and 10% in 2008, and shows every indication of continued growth. 7. An Australoid grouping that would include all those elements of primarily Australoid racial composition, consisting primarily of the Veddoid elements from central and southern India. 8. A grouping of "Afro-Hispanic" Caribbean peoples of mixed Congoid-Caucasian ancestry who are distinct from the African-American Congoid population. This grouping would include most Puerto Ricans and Dominicans as well as many Cubans, Panamanians, Columbians and Venezuelans. These elements comprised about .7% of the mainland U.S. population in 1970 and 1.4% in 1994. As illustrated by the above map, an independent nation for the Sub-Saharan African racial group (#2 above) could be formed out of the area of the states of Texas, Oklahoma, Louisiana and Arkansas north of the Colorado river, west of the Mississippi river, and south of the Arkansas river. It would include the cities of Little Rock, Shreveport, Oklahoma City, Dallas, Houston, Galveston, Austin and Amarillo. Its territory would be about 257,823 square miles (larger than France, which has an area of 213,009 square miles, or Kenya, which has an area of 224,081 square miles). An independent nation for the "Latino" or "Hispanic" Amerindian and Mestizo racial group (#3 above) could be formed from the territory of Texas south of the Colorado river, and New Mexico south of the line of 35 degrees north latitude. It would include the cities of San Antonio, Corpus Christi, El Paso and Alamogordo. Its area would total about 198,901 square miles (larger than Spain, which has an area of 195,988 square miles). An independent nation for the North American Amerindian population (#4 above) could be created out of the states of Arizona and New Mexico north of the line of 35 degrees north latitude and east of the Little Colorado and Colorado rivers. It would include the cities of Santa Fe and Albuquerque. Its territory would be about 66,798 square miles. An independent nation for the East Asian population (#5 above) could be formed from San Diego, Orange, Riverside and Imperial counties in California and Yuma county in Arizona. Its area would be 21,961 square miles (larger than Taiwan, which has 13,814 square miles) and would include the cities of San Diego, Anaheim, Palm Springs and Riverside. The non-European Caucasian and racially-mixed European combined grouping (#6 above) could be formed into two independent nations. One could consist of Florida south of the line of 29 degrees latitude and north of Collier and Broward counties, with an area of about 21,900 square miles (larger by half than the Netherlands, which has 15,770 square miles). It would include the cities of Palm Beach, Tampa, Sarasota and Orlando. The other could consist of San Bernardino, Santa Barbara, Ventura, and Los Angeles counties in California, Clark county in Nevada, and all of Arizona except for Yuma county and the territory which is part of the native Amerindian nation, with an area of about 126,162 square miles (larger than Italy, which has 116,311 square miles). It would include the cities of Los Angeles, Long Beach, Las Vegas, Flagstaff, Winslow, Phoenix and Tucson. The total combined area of both nations would be about 138,211 square miles. An independent nation for the Australoid grouping (#7 above) could be formed from Monterey, San Benito, Fresno, Kings, Tulare, San Luis Obispo and Kern counties in California. Its area would be 28,307 square miles (about the same size as the Netherlands and Belgium added together) and would include the cities of Fresno and Bakersfield. An independent nation for the Hispanic-Caribbean peoples of mixed African-Caucasian ancestry (group #8 above) could be formed from Broward, Collier, Dade and Monroe counties in Florida north of Long Key. Its area would be about 6,160 square miles, almost twice the size of Puerto Rico, which has 3,435 square miles. It would include the cities of Miami, Fort Lauderdale and Naples. The Hawaiian islands to the west of Oahu (Kauai, etc.) could be reserved for the native Pacific Islanders. Oahu and the islands to the east would belong to the Nordish nation, as the "crossroads of the Pacific" providing a strategically vital link between the Nordish countries of North America and those of Australia and New Zealand. The remaining territory of the United States would be an independent nation for the Nordish-centered European racial grouping. Its population of about 185 million (based on 1994 U.S. population figures) would be about 78.9% Nordish or Northern European (146 million in 1994), 11.9% Alpine-Dinaric-Ladogan or Central European (22 million in 1994), and 9.2% Euro-Mediterranean or Southern European (17 million in 1994). To preserve the predominantly Nordish character and identity of the new European-American nation its immigration policy should ensure that all future immigrants are all European and are proportionately at least as Nordish (79% or more) as the 1994 European-American population. The land area of the 48 contiguous states is 2,962,031 square miles. The partition proposal detailed above would allocate 2,234,573 square miles, or 75.4% of this area, to the Nordish-centered European racial grouping, which comprised 79.7% of the U.S. population in 1970 and 72% in 1994. It would allocate 727,548 square miles, or 24.6% of the area of the 48 contiguous states, to the other racial groups, who in 1994 totaled 28% of the population, but in 1970 comprised only 20.3% of the population. Thus, this proposal would grant 75.4% of the area of the 48 contiguous states to the racial group that was 79.7% of the population in 1970, and 24.6% of the area to the groups that totaled 20.3% of the population in 1970. All of the independent non-European nations resulting from the racial partition would be situated along the southern periphery of the United States. As the southern periphery already borders a non-European country and region (Mexico and the Caribbean) this would minimize the length of borders between the European and non-European races. None of the territory allotted to the non-European nations belonged to the United States before 1803. To prevent the proliferation of nuclear weapons, any nuclear weapons or production facilities located in non-European areas would be moved to new sites within the European area. Prisoners and other institutionalized persons would go with their race. With the exception of indigenous peoples, non-European racial elements in the other European countries of Europe, Canada, Australia and New Zealand would be encouraged to repatriate to their own racial homelands. If this is not practical (e.g., if their ancestral homelands block their return) they could join other members of their race in the appropriate successor state as given above.